Haskovo attracts ecotourists and those who enjoy history. It has a wealth of cultural monuments, including ancient dolmens, Thracian mounds, and Roman and medieval structures. Its mix of Upper-Thracian lowlands and mountainous vistas makes for beautiful scenery, and spa centres have been built around the region’s mineral springs. Haskovo’s mild climate favours diverse flora and fauna. Wine and beer production are among the region's specialties, and the famous Kamentisa brewery is located here. Haskovo’s wines (particularly the Merlots from the Stambolovo vineyards) are exported to the rest of the world, and are appreciated by connoisseurs. Two transcontinental roads cut through Haskovo, the first connecting Western and Central Europe, while the other connects Northern Europe to the Mediterranean. The region’s administrative centre is more than 1000 years old, and it’s no surprise that municipal landmarks include a Thracian tomb, Aleksandrovo, and the Orthodox Church of the Assumption in Uzundzhovo, built on the site of an old mosque. Haskovo was a vital trade hub in centuries past. 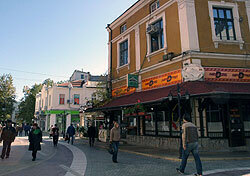 But Haskovo City is a modern centre as well, and recent investments and renovations have infused it with new life. Haskovo still has some reminders of days gone by, including the medieval fortresses of Hisaria and Asenova Krepost. More recently erected attractions include the 32-metre-high Mother of God and the Infant Jesus monument that overlooks the city on nearby Youth Hill. In a small, two-hall building, the 90-year-old, newly renovated Ivan Dimov Drama and Puppet Theatre performs classical and contemporary plays. Haskovo has a beautiful oak forest and park. Kenana is a spacious green area with tennis courts and a zoo. A folk festival known as “Colourful Thrace Sings and Dances” takes place in the park every year.